In addition to being a classic Jewish food, lox is arguably one of the most New York-y foods you can get. 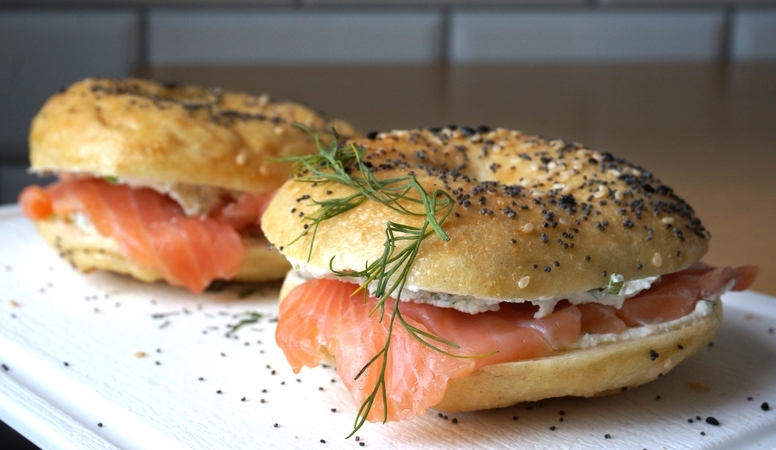 We have so many great bagel shops to choose from, but, as you might know, not everyone is choosy about their lox. Next time you’re on a mission for the best bagel and lox in town, try visiting one of the five shops below. Each spot has its own curated menu of smoked fish and at least one house-cured lox. Wondering what the difference is between lox and smoked fish? Our detailed guide to lox spells it all out. Even though lox has become synonymous with smoked fish, lox is brined, and smoked salmon is, as you might have guessed, smoked! Nova lox is brined fish that’s later smoked, and is probably one of the more popular way to top a cream cheese bagel these days. Read below for the best lox in the city, whether you want it salt-brined or smoked. Acme Smoked Fish is the prolific smoked fish supplier that works closely with many of the lox purveyors (including the ones below) throughout the city. Every Friday, it opens its factory doors to the public, offering tastings and an opportunity to buy the smoked fish at wholesale prices. It not only makes the classics, like belly lox and nova, but also several creative offshoots like pastrami nova and mesquite nova. For over 100 years, Russ & Daughters has been NYC’s premier appetizing store, specializing in lox, dozens of varieties of smoked fish, cream cheese and salads. Placing your order here is a treat in more than one way — the timeless decor of the store and the friendly staff behind the counter make it an experience. Head to Zabar’s for high-quality smoked fish and everything else you might need on your shopping list! It was originally known for selling smoked fish, and its reputation for selling the best in the city still holds true today. when your flight is cancelled and it's freezing rain ☕️😊#barneygreengrass "more american than apple pie"
Known as “the Sturgeon King of New York” since 1908, Barney Greengrass is a timeless lunch spot with delicious, house-cured lox. Lox is serves on bagels, in platters, and scrambled with eggs and onions. Have a seat at one of the formica tables, and settle in for some quality people watching as you nosh on your nova. Brooklynites don’t have to schlep to Manhattan to find good lox anymore — they can get it in this cheery Cobble Hill storefront. You’ll find a number of different smoked-fish bagel sandwiches like “Member of The Tribe” and “Brooklyn Transplant” on the menu. It has belly lox and house-cured lox, along with bagels, bialys and plenty of schmears. It also has a delicatessen menu, which features pastrami, knishes and kasha varnishkes. You’re go-to spot for just about any kind of Jewish specialty, Shelksy’s doesn’t disappoint.